Rene Paris (1881-1970) was a French Animalier sculptor specializing in horses. He studied under Georges Gardet in Paris. Rene Paris exhibited at the Salon Des Artistes Français from 1906 on, winning an Honorable Mention in 1907 and a Gold Medal in 1920. He also sculpted two monuments, the Monument de la Chapelle Saint-Fine of a Sleeping Lion in memory of the Soldiers of 130th Division in Verdun, and a life size Chien Loup (1928) in the Square de Saint-Lambert in Paris. He sculpted several portraits of race horses, including Pearl Diver, Souverian, L”Imperial, and Le Petit Prince, winner of the Prix du Jockey Club, and others. 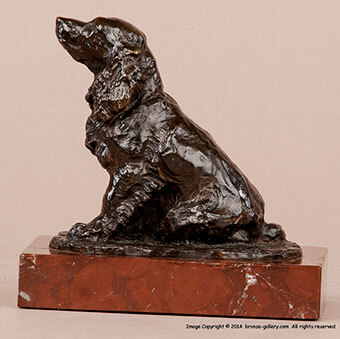 Along with horses, Rene Paris also created several small models of dogs. 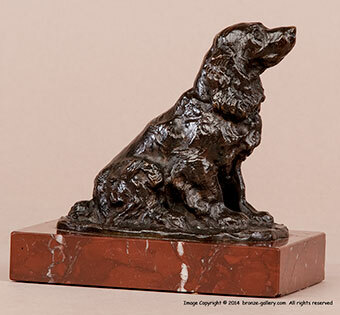 Here is a fine small bronze of a Spaniel dog sitting on the alert waiting for the command to fetch the game the hunter has shot. The Spaniel is very well modeled with good texture to his fur and an intent look. He has a dark brown patina and is mounted on the original red marble base. A sensitive portrait of a favorite hunting dog.